How fantastic to have The One, The Only – “The Voice”, Mr Russ Bray come into Unicorn Global HQ today to seal the deal on a new 3 year Ambassador agreement. This will take Unicorn’s association with Russ to an amazing 15 years. It’s not so easy to catch up with Russ these days as the demand for his Pro Referee’ing services sees him chasing the sun around the World. “3 days at home in the last 8 weeks” rumbled Russ, “Loved every moment of it”. Russ’s infectious enthusiasm for all things darts lights the room up, as of course does his trade mark “180” growl roared out to international audiences from Ally Pally to Auckland. It is a great pleasure to work with Russ at tournaments and at bespoke Unicorn events around the World. We are delighted to continue our association with such a unique character. 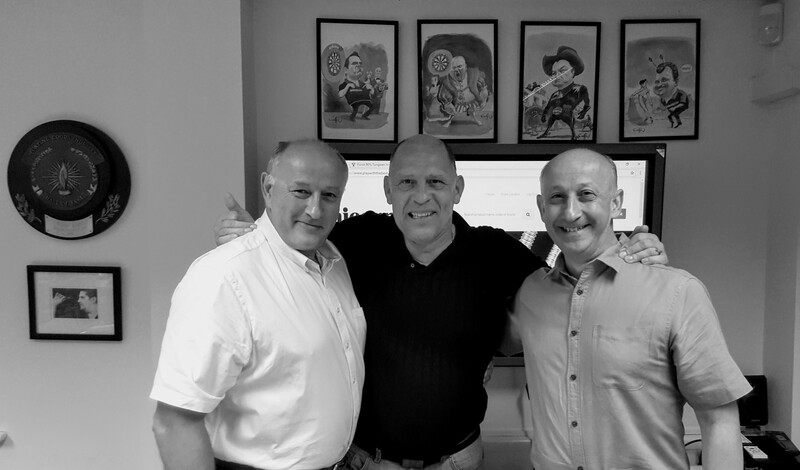 Pictured above are Russ with Richard & Edward Lowy, owners of Unicorn.